Spectacular! Beautiful Boicourt Trail is much better than expected. Get up above the landscape. See how far you can see from the peaks on Boicourt Trail. There’s still some snow, late winter, early spring south of Boicourt Trail, looking back toward Medora, hidden in the hills and valleys. This Theodore Roosevelt National Park Trail is rated easy to moderate, but you’re free to make it a stunning hike to new heights. Thanks to Kate at the Visitor Center who urged us to give Boicourt Trail a try. We were going to sample revisit some of our favorite moderate trails such as Jones Creek, Paddock or Talkington. We took all of the marked trail and just a portion of the trail extension. In an hour and a half, we burned more than 1,000 calories. So, it’s not extremely difficult, but it is extremely rewarding. Many square miles lay below the vantage point when you extend your hike beyond the marked Boicourt Trail. To get to Boicourt Trail, follow the scenic loop through the South Unit of Theodore Roosevelt National park outside of Medora. On the far northeastern side of the loop is the pull off for Boicourt Trail. Boicourt Trail is marked as an easy trail. It’s handicap accessible. However, for those who are up for the challenge, extending the trail will take you into the interior of the park for a moderate to difficult hike. The wide gravel path starts at the parking area and heads. It’s handicapped accessible and leads along a gentle ridge that opens above a valley. Many people extend the trail west beyond the marked easy gravel walkway. Following deer and bison trails, people can keep going west. The further you go on Boicourt Trail extension the more challenging it gets. It’s here that the exploration gets a bit more challenging, and probably impossible if it is muddy. If it’s dry, stay on the animal trail that will lead you up and down very impressive geology. You can take an easy jaunt over a very narrow ridge with steep drop-offs on either side. The path is in good condition and is as narrow as two to three feet. The steep drop-offs can be a bit unnerving – as much as 100 feet or more. The well-worn dirt path stops at a point where you will want to photograph the expansive valley below. Look beyond the valley — that’s Buck Hill in the distance. Trace your steps back to join the animal trail and continue further west. Now it gets more rugged. You’ll want to do it when the ground is dry and when you are wearing good gripping boots. Go ahead. Rest a while. Coyote tracks are apparent in the hardened mud. The ridge continues well into the interior of the park. Stop often to rehydrate with plenty of water. You’ll find rocks to sit on and rest. You’ll be glad you brought water with you. Along the way, you’ll be able to identify coyote, deer, elk and bison tracks. You’ll see why it’s best to take the trail when it’s dry. Even hoofed animals slip and slide on the hillside when it’s wet. It can’t be said too often. Turn around and head back to your vehicle before you are ready to end the hike. It’s easy to exhaust yourself going out and then struggle to return. Out and back obviously takes more energy than just one way. Keep in mind these tips for this hike. Start early so you’re not trying to find your way back in the dark. Be ever mindful of where you started. Turn round and look back to where you came from. There are both easier explorations in the Theodore Roosevelt National Park such as Buck Hill, Ridgeline Trail and the East Entrance Trail. Late winter, early spring is a good time to plan your hike, and then start with easy jaunts. Stay tuned, we’ll tell you about more challenging trails in the Park. You don’t have to stick to the trails in the National Park. Strike off on your own exploration on public ground if you have a Forest Service Map that marks public ground and some trails. The excitement is already building for those people who are about to make a trip to the Theodore Roosevelt National Park. We’re here to help with regular articles from the Badlands. Just tells us where to sent the notice of a new article. Enter your email in the box in the upper right. 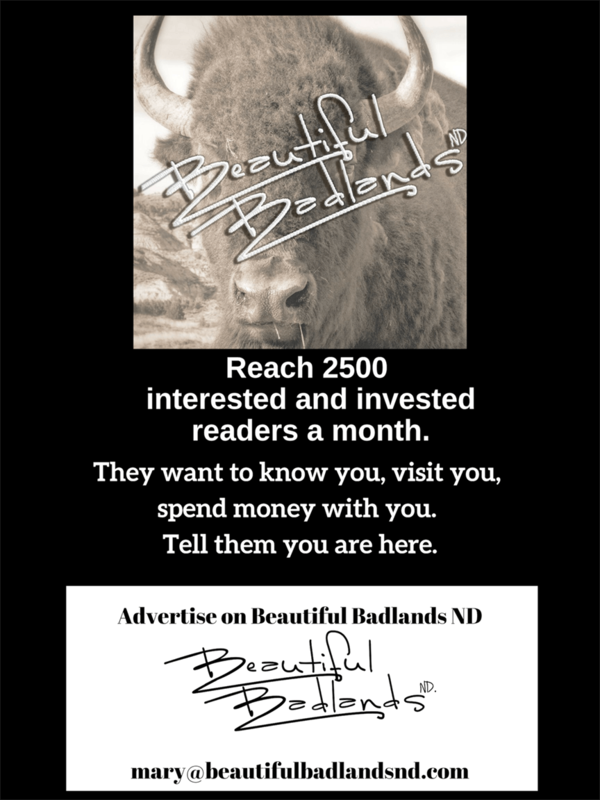 If you follow us on Facebook, you’ll get all kinds of valuable information from sources all over the world that write about the North Dakota Badlands. Beauty from the Heart of the Badlands. A photo exhibition from the heart. Don’t drive by. Get into the Beauty of the North Dakota Badlands.